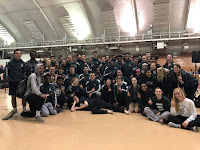 Friday night brought together the Madison Memorial track & field athletes to compete as a unified unit in relay events. The 100m dash & 3200m run were competed individually as all other events were either a relay, a shuttle, or a combination of heights/distances in field events for scoring. This meet allows are team to compete in some new events like a 3x100m hurdle shuttle or the distance medley relay (400-800-1200-1600). Teams are rewarded in this style of meet for strong top performers and depth across event areas. Our boys team amassed 111 points to finish in 2nd place behind Baraboo's 120 points. For the girls we scored 102 points finishing 3rd behind Beaver Dam's 111 points and Reedsburg's 103 points. It was a strong performance by both teams. The boys squad was led by victories in the 3x110m hurdle shuttle comprised of Daurice F, Micah P, & Hunter P (47.7), the 4x100m relay team of Jake A, Daurice F, Jason W, & Jared B (44.3), Throwers 3x100m Shuttle of Ryan B, Jeremy G, & Jack G (37.0), Triple Jump by Micah P, Eligh A, Jezell T with a combined leap of 121' 7", and Long Jump by Daurice F, Micah P, & Jezell T with a combined effort of 61' 3/4". Other top three finishes included: Jake A 2nd in the 100m dash (11.3), Jake R 2nd in the 3200m run (10:03.0), 2nd place in the High Jump by the group of Hunter P, Jezell T, & Darrion M (16' 8"), 2nd place in the discus by Ryan B, Jeremy G, & Jack G (378' 11"), and 3rd place by Jake A, Anthony H, Eligh A, & Alex B. in the 4x200m relay (1:36.7). The girls squad earned wins in the 3x100m hurdle shuttle with a team of Mariah OF, Phibi M, & Natalie S (53.2), High Jump by Sydney S, Kayla G, Natalie S with a combined height of 14' 0", Margot W in the 100m dash (13.0), and the Distance Medley Relay with Marcella V, Meghan S, Amelia F, & Siena C (13:09.0). Other girls earning valuable points with top 3 finishes include: a 2nd place by the 4x200m relay of Margot W, Emma Cate M, Allison H, & Sydney S (1:51.5), 2nd by Siena C in the 3200m run (11:35.1), 3rd place by Christina M, Kelly S, & Holly H in the discus (271' 6"), 3rd in the 4x400m relay of Meghan S, Amelia F, Mariah OF, & Sydney S (4:17.7), and a 3rd place by the pole vault team of Kayla G & Sarah H.
Tonight's meet produced great individual PR's and multiple season best relay times. It is two and half weeks until the Conference Championships. Now is the time to fine tune our performances so we are ready to peak in the final month of the season. Get some extra sleep, eat healthy meals, take care of your body, & be ready for a fun & fast finish to the season.